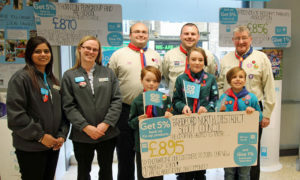 Thornton Scout Group tonight gratefully received a cheque for £895 from Thornton Co-Op’s Community Fund. Over the last 4 months, 1% of takings from all Co-Op own brand purchases by members in-store have been set-aside to support local good causes. Thornton Scout Group received over one-third of this pot which will be used to support our youngest members in attaining a recognised water-sport based award, suitable to their age, over the summer months. Dave Norris (Assistant Scout Leader) commented: “This latest donation from Thornton Co-Op is greatly appreciated by our youth membership. We would like to thank both Kiran and her team, along with the villagers of Thornton for choosing our group as worth benefactors of the Community Fund”. It’s not too late to support us yet either, as we have been fortunate to be selected to be supported over the next 4 months of funding! Thornton Scout Group can be selected in your online Co-Op membership account as your preferred benefactor – please contact us if details of how to change your preferences are required. Pictured: Dave Norris (ASL) who progressed our application was on-hand to collect the cheque from Store Manager Kiran Bains and Duty Manager Sarah Hargreaves. Jack, Anthony and Isabelle, represented each section which will benefit from this funding, along with Steve Preston (SL) and Chris Jennison (ABSL).